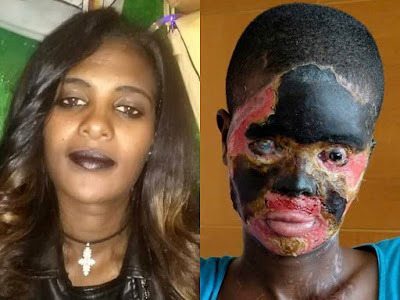 A wife has been left blind and unable to speak after her mouth was melted shut when her own husband poured acid all over her face. Atsede Nigussiem, 26, was at home in Tigrai, Ethiopia, when she opened the door to estranged partner Haimanot Kahsai, 29. Without warning he launched a sickening acid attack leaving his wife in agony as their five-year-old son Hannibal Kahsai slept inside. Such is the severity of her injuries, she has to eat and drink through a straw and spends all day crying - one of the few things she can still do. After the attack, Atsede ran screaming into the street for help from neighbours while Kahsai fled into the night. Two months later Astede is still in pain, her mouth has been melted together so she cannot talk, she is blind in her left eye and at severe risk of losing the sight in her right eye. She eats and drinks with a straw and spends all day 'crying non stop' - one of the few things she can still do. She is now receiving treatment from burns specialists in Bangkok, Thailand. Communicating in writing, she said: 'I don't know why my husband did this. I was at my parents house late at night. Astede said she had been married for five years to her husband before he moved to neighbouring Yemen for work February and lost contact. He then returned unexpectedly and launched the unprovoked acid attack after turning up unannounced at 11pm on July 15. Atsede was rushed to hospital where doctors gave her emergency care for wounds on her face, chest, hands and legs. But medics recommended travelling abroad for long-term care and treatment. The devastated mother flew to Bangkok with her sister where burns specialists at the city's Vejthani Hospital are now battling to save the little eyesight she has left and treat her skin. Regional manager Masha Zhigunova said Atsede 'cries non stop' and cannot talk, eat or drink properly because her 'mouth is melted together'. She said: 'This is a very difficult case. Astede's face will never be the same again. 'One eye is gone and the second eye is almost gone and her skin is all melted. Zhigunova said that Astede is being treated by Dr Sivat Luanraksa who is experienced in dealing with severe burns. She added: 'Astede requires debridement of necrotic tissue on her face and extremities. 'Secondly, she needs debridement and acellular dermal matrix grafting and thirdly, split thickness skin grafting. Zhigunova has launched a donations page for Atsede's private medical care. God why.. I am so sad.. See what beauty is turned to courtesy of a fellow human being, her husband at that. May God ease her suffering and restore her health to shame that son of Lucifer. I just wish it were a lie, how can a man do this? They should give him the acid to drink.